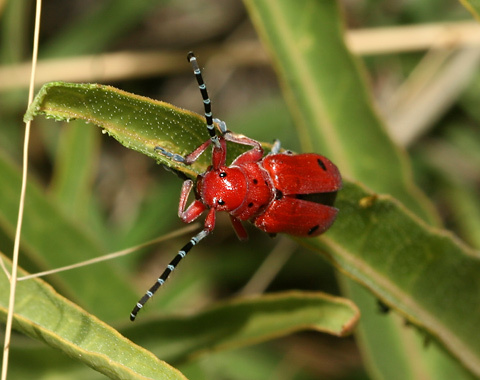 I spotted this colorful Milkweed Longhorn Beetle (Tetraopes sp.) in a grassy area south of Tucson in early July of 2006. The various species of Milkweed Longhorn Beetle (Tetraopes spp.) feed on Milkweeds (Asclepias spp. ), with each generally feeding on a single, different species of Milkweed. 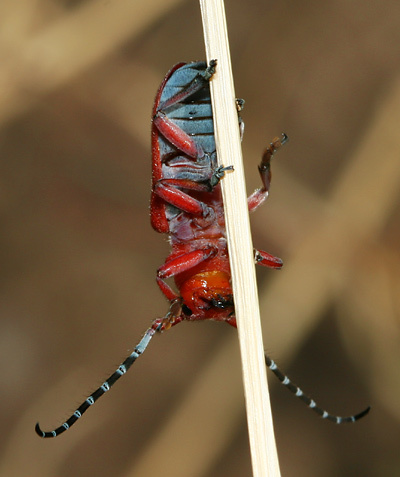 Female Milkweed Longhorn Beetles will lay their eggs in grass near a chosen Milkweed host plant. When the larvae hatch, they will burrow into the ground to feed on the Milkweed roots. 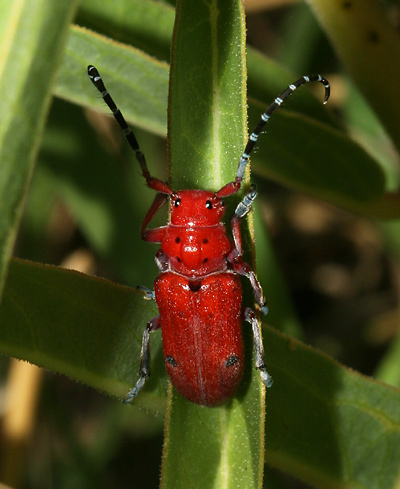 The adult Milkweed Longhorn Beetles feed on Milkweed flowers and the tender upper leaves. Milkweeds are poisonous, and the creatures that eat them like Milkweed Longhorn Beetles acquire their toxins and become poisonous as well. This beetle's brilliant aposematic coloration is meant to warn potential predators that it is not safe to eat, and while its bright colors may keep birds away, they have the opposite effect on eager photographers, much to this poor beetle's annoyance. The annoyed beetle flew off to a patch of dry grass, but I was easily able to spot it once again and get a photo of its equally colorful underside.